A map showing Valoran and the location of what is believed to be a new continent, obscured by a magical illusion. The yordles of Bandle City have used the “dark sand” found in Shurima to refuel the Mothership and voyage to Runeterra’s moon. Looking down at the planet, they discovered something remarkable: a previously unknown continent not far beyond Valoran’s shores, ringed with islands. A magical distortion ran along its borders. How had it not been discovered before? A League expedition braved encounters with the titanic beasts of the ocean depths and tumultuous storms to investigate this mystery. The Summoners on board reached out with their arcane senses and discovered an illusion screen fencing off the entire region, at least from any likely terrestrial vantage point. The Council’s audience hall was soon filled with the clamor of delegates demanding authorization to explore this remarkable new territory and make contact with whatever peoples might there be found. This matter will be adjudicated before the League of Legends. But first, it must be determined which factions will be permitted to press their claims on the Fields of Justice. A fourth faction will be added by a vote among Zaunite Summoners. This is the traditional prize for winning an arc. We hope to start the sixth arc in the next week or so. The yet unnamed sixth Factions arc will begin in August. The first step is selecting which factions will be playable. We have decided that Bilgewater will get its debut in this maritime storyline. Next, we want to see which other factions the general League community most wants to see. You can vote below. After that, we’ll give Summoners from last arc’s victorious faction (Zaun) a private vote to add another faction, per Factions tradition. Click here to go straight to the vote. Read on for more information about the factions that are available for selection. Lore: A lore-based description of the faction. Objective: Why they want to explore this continent. Gameplay: Playstyle notes for the faction. Core Champions: Champions they’ll likely start with. These are the “can’t have Demacia without Garen” Champions whose absence would be very noticeable. Secondary Champions: Champions who will definitely be available as pickups during the arc, though not all at once; factions will have to strategize and prioritize. Tertiary Champions: These are wildcard Champions with tenuous ties to the faction. They might be available for pickup, if the faction really works for it. Champion lists are somewhat subject to change. We might also, e.g., add in some “free agent” Champions which any faction has the potential to win. Core and Secondary Champions are pictured. These are the Champions most likely to make an appearance for each faction. Note that starting rosters will likely be smaller, and that (judging from past arcs) bigger rosters are not necessarily stronger than smaller rosters. Lore: The yordle homeland, a tight-knit community organized around the Mothership, hugs, and cupcakes. Objective: To find new friends! Lore: A kingdom dedicated to order and justice. Objective: Forge an alliance with, and offer protection to, any peoples inhabiting the new continent. Gameplay: All-in “dogpile” early-game teamfight; tanky. Lore: Tribes which, when united, become one of the mightiest forces in Valoran. Objective: Gather resources needed for the Freljord to thrive. Gameplay: Hope the enemy team doesn’t buy Swifties. Lore: An insular realm of mystic insight, made up of many independent clans. Objective: Learn the arcane secrets of this new land and its people. Gameplay: High mobility, moderate teamfight, only one “real” ADC. Lore: A military state that reveres the freedom of the strong to take what they wish. Objective: Seize control of this continent for Noxus, and for refugees of the Void War. Gameplay: Assassination; heavy CC and burst; early-game dominance. Lore: A technological civilization focused on commerce and industry. 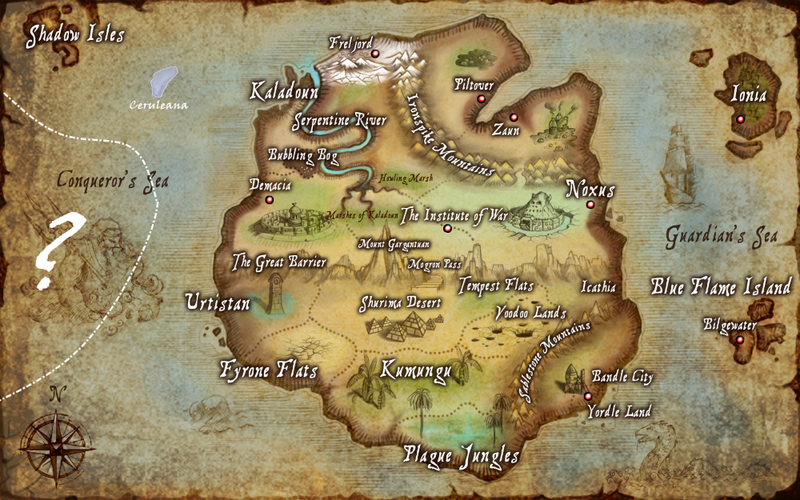 Objective: Explore the island and establish a trade network with its inhabitants; expand Piltover’s naval presence. Gameplay: “Poketover” is a high-skillcap faction that relies heavily upon good positioning and strategic timing. Lore: The lands of the restless dead, ruled by necromancers and dark sorcerers. Objective: Something involving spooky ghosts and skeletons. Their petition probably said something about granting its inhabitants the gift of undeath. Gameplay: No “real” ADC on its core/secondary rosters; relies on AoE teamfights and melee ADCs. One of the most counter-meta factions out there. Some people think we’re being too harsh on Urgot with that “no real ADC” comment. But in truth, he’s more of a fighter/ADC hybrid. You might say he only counts as half an ADC. Victories: part of Discord, which won that arc. Lore: A barren desert, once home to a powerful civilization. Not currently recognized by the League; if selected, this would be its debut. Objective: Gain magical power strong enough to revive Shurima. Shurima has not yet participated in an arc. Lore: Extradimensional monsters that seek to devour Runeterra. They have broken free of the Institute’s confinement and now reign over Icathia. Objective: The principalities of the Void offer the League a deal: allow it to consume this new continent, and it will leave Valoran be, at least for a time. Gameplay: Although the Void itself has never appeared as a faction, the “Discord” faction was essentially the Void plus a couple Shadow Isles Champions, and did very well with a split-push strategy. Lore: A libertarian technopolis built around the free pursuit of whatever looks fun or profitable. Longtime ally of Noxus; Piltover’s crazy twin sister. Objective: Depends which corporation you ask; probably involves strip-mining the place. Bilgewater has already been set as a starting faction. It’s about time they had a chance to prove their mettle. For the public survey, each Summoner gets three votes: a primary vote (worth 6 points), a secondary vote (worth 3 points), and a tertiary vote (worth 1 point). Summoners can stack all three votes for one faction, or split them up as they like. When you click “submit”, you’ll get a link that you can use to edit your responses. Save that link! Please don’t send in duplicate votes. Certain Summoners will receive bonus reward votes, e.g. for recruiting friends to Factions in the previous arc or for running balance testing matches. I’ll contact those Summoners separately. They’re still entitled to vote normally; the reward vote will be added on top. Thanks! I’m looking forward to seeing which factions will be in the next arc. When do Zaunites get an extra vote, or is that otherwise incorporated in a way I have oversighted or ignored? It’ll be posted after the public vote closes, presumably this weekend.